The word ‘Shimla’ derived from ‘Shyamala Devi‘, another name of the Hindu Goddess Kaali. The altar at Jakhoo Hill was initially shifted by the British to the place known as Kali Bari Temple at present. The hill station is enveloped by seven hills that include Jakhoo Hill, Bantony Hill, Prospect Hill, Summer Hill, Observatory Hill, Invererarm Hill and Elysium Hill. The historic Hindustan Tibet Road was commissioned in 1850 commencing from Kalka to Shimla and thereafter to the China ruled, Tibet. In 1864, the town of Shimla was declared as the summer capital of the British Empire in India. Another major event in the history of the Shimla was laying of the foundation stone for the Kalka-Shimla railway in 1903. 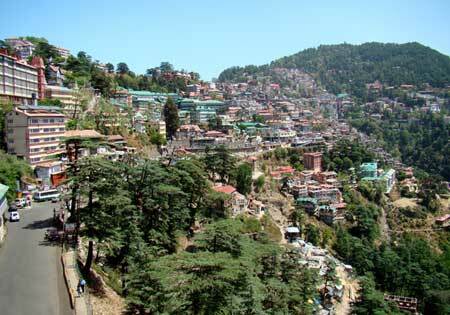 The vast majority of the area occupied by the present-day Shimla city was dense forest during the 18th century. The only civilization consisted of the Jakhoo temple and a few scattered houses. The area was called ‘Simla’, named after a Hindu goddess, Shyamala Devi. The bridge connecting Shimla with Chhota Shimla, originally erected in 1829 by Lord Combermere, Shimla, 1850s. The area of present-day Shimla was ruled by Bhimsen Thapa of Nepal in 1806. The British East India Company took control of the territory as per the Sugauli Treaty after the Anglo-Nepalese War (1814–16). In a diary entry dated 30 August 1817, the Gerard brothers, who surveyed the area, describe Shimla as “a middling-sized village where a fakir is situated to give water to the travellers”. In 1819, Lieutenant Ross, the Assistant Political Agent in the Hill States, set up a wood cottage in Shimla. Shimla district lies between 30°45′ and 31°44 North Latitude and between 77°0′ and 78°19′ East Longitude. It touches Mandi and Kullu in North, Kinnaur in the East, Uttar Pradesh in the South and Sirmaur district in the West. The capital of the state of Himachal Pradesh, India. Well known as the Queen of Hills, is an all time destination for tourists, for lovers of nature and solitude. In the early 19th century passing through various phases of Gurkha wars the young Major Kennedy decided to build the first permanent residence in 1822 to get relief from the heat of the planes and settle in cool, healthy climate. Situated on the lower spurs on North-West Himalyas at a height of 2205 meters it has always enticed and cast a spell on anyone who set ones foot on these slopes once. Climate Summer Max. 29*C. Min. 07* C.
Climate Winters Max. 18* C. Min. -03* C.
Airways: Nearest airport is Jubbarhatti, 23 km from Shimla. Train: Connected by narrow gauge to Kalka 96 km from Shimla. Although Kalka is connected to other destinations like Delhi, Kolkata and Amritsar by broad gauge further, train takes about 6 hours from Kalka to Shimla. In winter, the temperature can drop below freezing point when heavy woolens are required. Summer temperature are mild and light woollens/cottons are recommended.